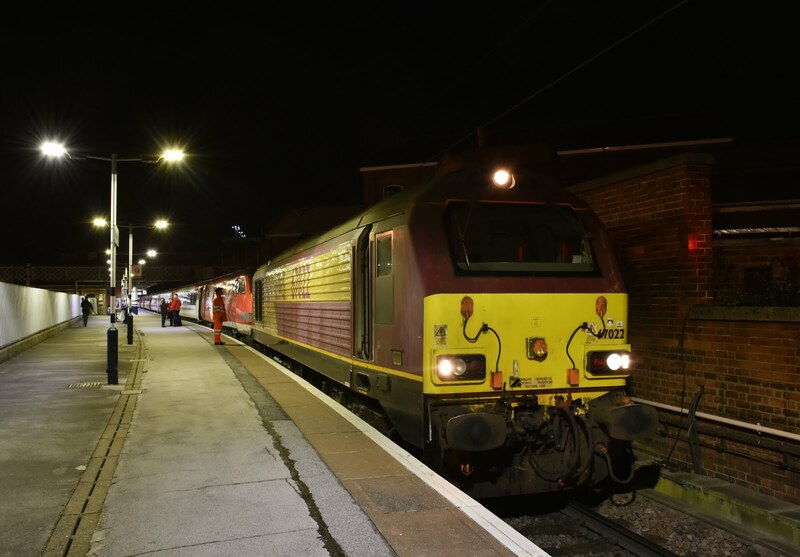 via Spalding and Lincoln to reach Newark Northgate. 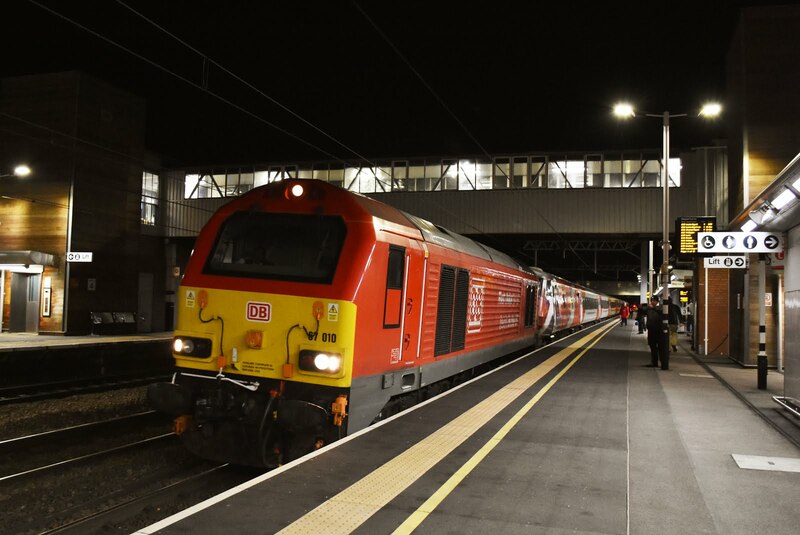 The East Coast Inter City franchise has long established the value in running through trains during times of engineering works. While journey times can be significantly extended when the usual 'direct' ECML route is closed it is still far preferable to have passengers on one train rather than having to de-camp and change onto a rail replacement bus only to have to repeat this process at the other end of the journey. 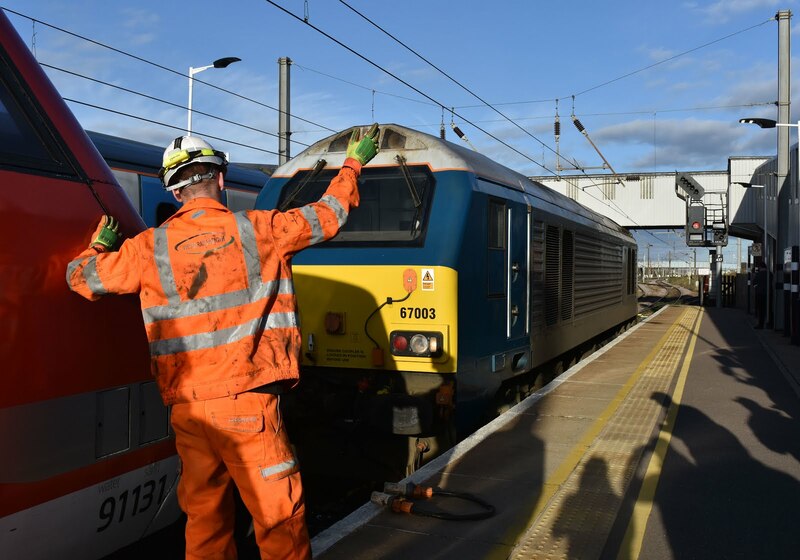 During November a series of works in the Grantham area have once again necessitated Virgin Trains East Coast to divert services away from the ECML between Peterbrough and Newark/Doncaster. Most services are in the hands of HST's which leave the main route at Peterbrough and travel by way of Spalding and Lincoln. Trains which serve Newark Northgate then diverge to the left while those continuing on the more direct route north continue through Gainsbrough Lea Road to re-join the ECML at Doncaster. The diversions cause the HST fleet to be worked particularly intensively and inevitably there are not quite enough sets to go around- VTEC therefore turns to the loco-hauled option with several trains each day booked for Intercity 225 sets (Class 91 with Mk4 coaches) which are then dragged by a DB Cargo class 67 over the non-electrified routes. I sampled the diversions on Saturday 18th November where three class 67's were in use, 67003, 67010 and 67022. I travelled on 1D09 the 08:48 Kings Cross - Leeds (to Doncaster) which was dragged by 67003 between Peterbrough and Newark (via Lincoln) and returned on 1E21 the 15:30 Edinburgh - Kings Cross (from Doncaster) which was dragged over the longer route from Doncaster to Peterbrough (via Gainsbrough and Lincoln) by 67022. Journey times were extended both by the diversions and also the time allowed to attach and detach the loco at each end of the drag (around 15 minutes on each occasion)- however the willingness to provide a through service should be commended, and the chance to enjoy some fairly unusual loco haulage is also something for the enthusiast to savour. Aside from the VTEC diversions Hull Trains and Grand Central were also diverting their services via Lincoln using their usual class 180 DMU's.